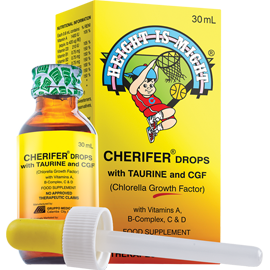 Cherifer Drops is the vitamin preparation packed with Chlorella Growth Factor (CGF) to maximize children’s growth potential. It also contains 150% RDA of Vitamin C for increased resistance against infection as well as serving as an excellent antioxidant needed for growth, development, and maintenance of healthy gums. 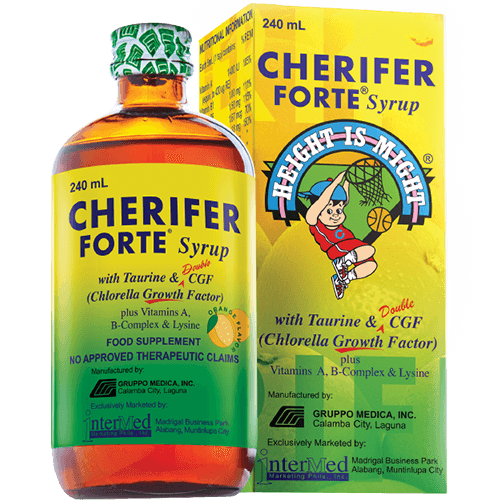 CHERIFER FORTE is the vitamin preparation fortified with double Chlorella Growth Factor to maximize growth potential and provide cell nourishment. 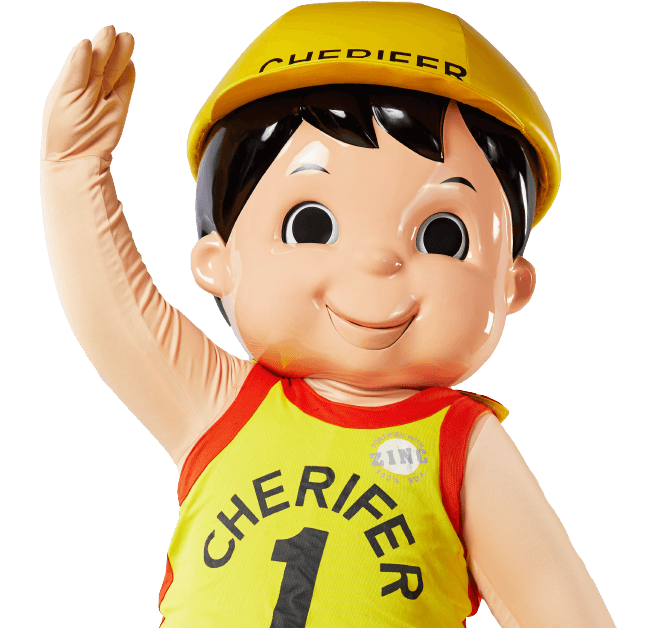 It also has Taurine that helps with the mental development of children. 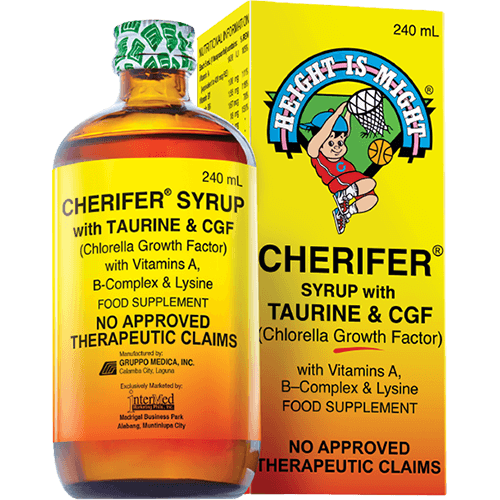 Cherifer Syrup is packed with Chlorella Growth Factor to help maximize children’s growth potential. On top of that, it also has Lysine to enhance children’s appetite, Vitamin A for improved vision, and Taurine for the optimum brain-development of a smarter, healthier child. 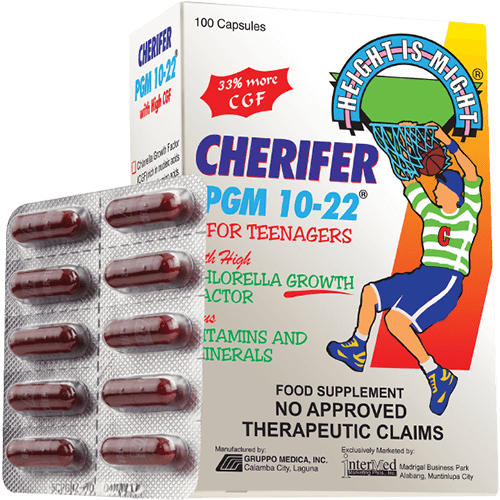 Cherifer PGM combines the power of Chlorella Growth Factor that helps the body maximize its full growth potential and Zinc to help increase the body’s resistance against sickness and infection. 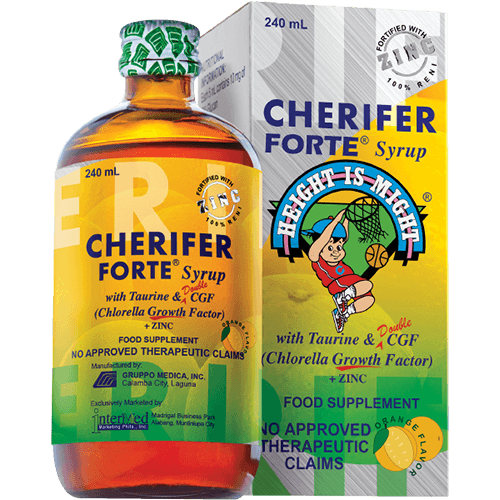 Cherifer Forte with Zinc has double Chlorella Growth Factor that maximizes children’s growth potential while building up their resistance to disease. Zinc reduces the incidence of lower respiratory tract infections such as pneumonia in children. 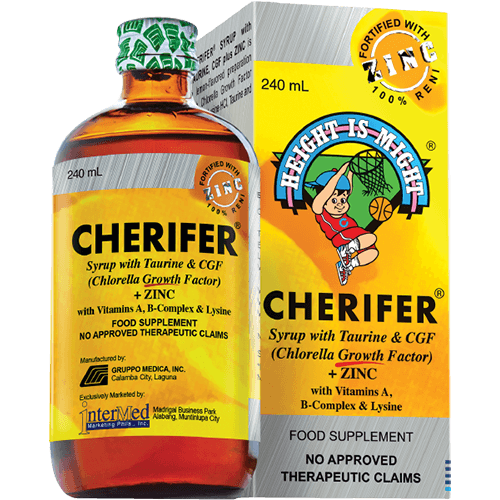 Cherifer Syrup with Zinc maximizes children’s growth potential through Chlorella Growth Factor while building up a stronger immune system for them with the help of Zinc. It also has Taurine for developing better visual and motor skills, and sufficient amounts of B-complex vitamins that help in the absorption and utilization of proteins, fats and carbohydrates in a child’s diet. 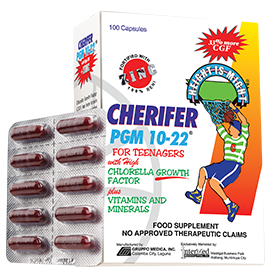 Cherifer PGM combines the power of Chlorella Growth Factor to help the body maximize its full growth potential and Zinc to help increase the body’s resistance against sickness and infection. Cherifer Immunomax is a food supplement that combines the power of CM-Glucan and Chlorella Growth Factor to balance the immune system and maximize growth potential.